The monks who compiled various genealogies for their patrons, the kings of Ireland, "traced" the lineage of Gaelic royalty back through the mists of time to the first who landed in Ireland and further back all the way to Adam. The historical kings in this lineage probably begins with Fergus' grandfather, Eochaid Muinremuir MacAengusa... before that... it's anybody's guess! But, I place it here as it is interesting and, in defence of the compilers of these genealogies, probably has some basis in fact as genetic studies show that the early settlers of Ireland were probably from Iberia and previous to that from elsewhere in the Mediterranean. So, we will start this genealogy with our ancestor who lived the longest... Methuselah. Niul was a prince of Scythia and a favorite of the Pharaoh Ankhkheperure and married his daughter Scota. Gaodhal was cured by Moses and his name is the origin of the word Gaelic. Asruth assisted Moses in his escape to Israel. Sru was driven out of Egypt and went to Crete. Eimher was the conqueror of Scythia and was killed by Noemus from whose father he had usurped the throne. Tait was king of Scthia and continued the wars with the old Scythian rulers. Agnon of Scthia killed a rival king and fled, dying in the Caspian Sea. Lamhfionn of Crete was told by a fortuneteller to head for Europe's westernmost island. BRATH MacDEATHA, King of Geulia and Galicia. Breogan/Brian completed to conquest of northern Iberia. He was king of Galicia, Andalusia, Murcia, Castile and Portugal. II. Ith- Ith/Ioth sighted Ireland from the top of the Tower in Brigantia, Spain. He was killed by the Tuatha-de-Danans. Milesius the mythical founder of Ireland has numerous super-hero exploits attributed to him. He also supposedly married a princess of Egypt, another princess of Sythia, the sister-in-law of Solomon, and a Scottish princess. III. Eber Finn- killed at the Battle of Ardeath by his brother Heremon. Eochaid Buiglaig/Buaid was the last king of Firbolg. Augaine "the Great" sailed to and attacked Africa and Sicily. Murdered his brother Badbchadh who was High King for only three hours. Cobthach or Caol Bhreagh was murdered by his nephew Labhraidh Loingseach Mae MacOiliolla Aine and his death was commemorated in the oldest Irish poem. Melghe or Meig was murdered by Maoib. Irereo or Iaran was murdered by Fearchorb. Fiacha Aighneach (cursed), was supposedly cast into the sea and found by fishermen and taken to Scotland (Fer Mara) where his son Fergus became Fergus I, king of the Picts. Several early sources, the Senchus Fer n-Alban and the Duan Albanach, list Erc's father as Eochaid Muinremuir. Prior to Eochaid, the genealogy seems to "appear" in the middle ages and is VERY suspect if not entirely factitious... although the medieval chroniclers may have been putting down the Celtic oral histories. Francis John Byrne, Irish Kings and High-Kings. Four Courts Press. 2nd edition, 2001. Donnchadh Ó Corráin (ed. ), Genealogies from Rawlinson B 502, at University College Cork: Corpus of Electronic Texts. 1997. John O'Donovan (ed. and tr. ), Annala Rioghachta Eireann. Annals of the Kingdom of Ireland by the Four Masters, from the Earliest Period to the Year 1616. 7 vols. Royal Irish Academy. Dublin. 1848-51. 2nd edition, 1856. John O'Hart, Irish Pedigrees. Dublin. 5th edition, 1892. T.F. O'Rahilly, Early Irish History and Mythology. Dublin Institute for Advanced Studies. 1946. Fergus the Great Mac Erc was king of Dalriada. This kingdom was established in the fifth century by Scots from Ireland. They crossed the Irish Channel from Antrim and settled in Argyll (the Frontier of the Gael). When the Ui Neill pressed north from Tara into Ulster in the fifth century Fergus moved the capital of his kingdom from Antrim to Dunadd in Argyll. 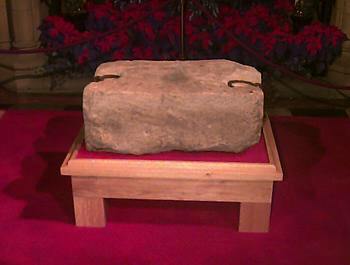 Wyntoun in his "Cronykil" states that Fergus was the first Scot to rule in Scotland and that he brought the Stone of Destiny with him from Ireland. m. INGENACH or LLEIAN, niece of King Cymbeline, d. of King Dumnagual Hen of Alt Clut. In the Rawlinson B502 manuscript from c.1130 contains the tale probably written by a poet at the court of Diarmait mac Maíl na mBó to cement the alliance between Diarmait and the Scots King Máel Coluim mac Donnchada who claimed decent from Áedán. Gein Branduib maic Echach ocus Aedáin maic Gabráin (The Birth of Brandub son of Eochu and of Aedán son of Gabrán) states that Áedán the twin brother of Brandub mac Echach, a King of Leinster who belonged to the Uí Cheinnselaig kindred and was switched at birth for one of the twin daughters of Gabrán born the same night so that each family could have a son. Áedán became king after the death of his uncle Conall mac Comgaill in 574. His succession to the crown may have been contested as Adomnán states that Columba had favored the candidacy of Áedán's brother Eoganán. Adomnán also states that Áedán was ordained King of Argyll by his cousin St. Columba, the first known ordination in Britain. The Annals of Ulster as well as the Annals of Tigernach record a battle in Kintyre after Conall's death in 574, referred to as the Battle of Teloch or Delgu "Dúnchad, son of Conall, son of Comgall, and many others of the allies of the sons of Gabrán, fell." Báetán mac Cairill may have been the antagonist in this battle as he is said to have forced the King of Dál Riata to pay homage to him at Rosnaree on Islandmagee. Following Báetán's death in 581, the Ulstermen abandoned the Isle of Man, which they had captured in Báetán's time, perhaps driven out by Áedán who is recorded as fighting there in 583. In 575 the Annals of Ulster record "the great convention of Druim Cett" at Mullagh or Daisy Hill near Limavady with Áed mac Ainmuirech, Columba as well as Áedán in attendance. The purpose of this meeting is not clear, however, it seems that an agreement was made concerning the status of Áedán's kingdom and he and Áed agreed that the Dál Riata fleet would serve the Uí Néill, however, they would not pay any tribute to them and soldiers would be provided only from the Dál Riata lands in Ireland. This agreement may have been the result of the threat from Báetán at this time. About 580 Áedán raided the Orkney Islands which had been subject to Bridei, son of Maelchon, King of the Picts. About 590 Áedán fought against the Miathi or Maeatae, a tribe in the area of the upper Forth. Adomnán states that the battle was successful, however, Áedán's sons Artúr and Eochaid Find were killed in this battle of Leithreid or Leithrig. The Prophecy of Berchán states Áedán "Thirteen years (one after another) [he will fight against] the Pictish host (fair the diadem)." The only recorded battle between Áedán and the Picts occured after the year 599 at Circinn where Áedán was defeated. A number of Welsh histories of the time tell of wars between Áedán and King Rhydderch Hael of Alt Clut, the north British kindom later known at Strathclyde. Adomnán states that Rhydderch sent a monk named Luigbe to Iona to speak with Columba "for he wanted to learn whether he would be slaughtered by his enemies or not". A Welsh triad names Áedán's plundering of Alt Clut as one of the "three unrestrained plunderings of Britain", and the poem Peiryan Vaban tells the tale of a battle between Áedán and Rhydderch. The lost Irish epic, Orgain Sratha Cluada, is usually thought to refer to the attack on Alt Clut in 870 by Vikings, however it may refer to an attack by Áedán on Rhydderch. The Venerable Bede states that Áedán was defeated by Æthelfrith of Bernicia at the Battle of Degsastan. Bede states that: "[f]rom that day until the present, no king of the Irish in Britain has dared to do battle with the English." Æthelfrith's brother Theodbald and his soldiers were killed and the Irish Annals name his killer as Máel Umai mac Báetáin of the Cenél nEógain, son of High-King Báetán mac Ninnedo. The Irish poem Compert Mongáin states that the king of Ulster, Fiachnae mac Báetáin of the Dál nAraidi, aided Áedán against the Saxons. The Anglo-Saxon Chronicle mentions that Hering, son of King Hussa of Bernicia, was present, apparently fighting with Áedán. After this defeat Áedán either abdicated or was deposed. The Prophecy of Berchán states that: "he will not be king at the time of his death" and nothing is recorded in the annals about him until his death in 609. John of Fordun states that Áedán was buried at Kilkerran in Kintyre. According to Adomnán, St. Columba forsaw that Eochaid Buide "yellow hair" would succeed his father. Eochaid was evidently a co-ruler for the last two years of his reign with Connad Cerr who predeceased him. 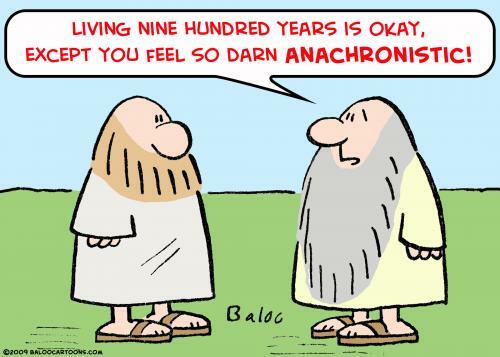 Eochaid was king of the Scots of Argyll and perhaps also king of the Picts. Domnall Brecc "the freckled" first appears in the Annals of Tigernach in 622 when he was at the Battle of Cend Delgthen in Ireland as an ally of Conall Guthbinn of Clann Cholmáin. Unfortunately, this was the only battle where Domnall was on the winning side. Domnall suffered four defeats after he broke Dál Riata's alliance with the Cenél Conaill clan of the Uí Néill. In Ireland, Domnall and his ally Congal Cáech of the Dál nAraidi were defeated by Domnall mac Áedo of the Cenél Conaill, the High King of Ireland, at the Battle of Mag Rath (Moira, County Down) in 637. He also lost to the Picts in 635 and 638 and finally to Eugein I of Alt Clut at Strathcarron in 642, where he was killed. And bore themselves splendidly around the conflagration. And the head of Dyfnwal Frych [Domnal Brecc], ravens gnawed it. Domangart is not listed in the Duan Albanach but is included in the genealogies of William the Lion and of Causantín mac Cuilén found with the Senchus fer n-Alban where he is noted as the father of Eochaid mac Domangairt. The Annals of Ulster for 673 report: "The killing of Domangart, son of Domnall Brecc, the king of Dál Riata." Eochaid was king of the Dal Riata in 697 and the Annals of Ulster recorded the killing of "Eochu nepos Domnaill" in that year. Eochaid III was the last of the Dalriada kings to reign on both sides of the Channel. After his reign the kingdoms were split into two separate entities. He came to power as King of the Dal Riata in 726 after deposing Dúngal mac Selbaig. Selbach may have tried to restore his on to power and fought against Eochaid's army at Irros Foichnae in 727 but without success. At his death in 733 the annals call him king rathat than lord of Dal Riata implying that after the defeat of Dúngal and Selbach his reign was unchallenged. Aedh Find "the White" was at war with the Picts in 768 with the Annals of Ulster reporting "Bellum i Fortrinn iter Aedh & Cinaedh" (a battle in Fortriu between Aed and Cinead). His death in 778 is also noted in the annals and he was succeeded in the kingship by his brother Fergus. The Annals of Ulster and of Innisfallen give Kenneth's father as Alpin, John of Fordun calls Kenneth's father "Alpin son of Achay (Eochu) and has him killed in war with the Picts in 836. Alpin is a Pictish name, derived from the Anglo-Saxon name Ælfwine. Dowchty man he wes and stout, All the Peychtis he put out. Gret bataylis than dyd he, To pwt in freedom his cuntre! George Buchanan in his Rerum Scoticarum Historia added a great deal of unsupported details stating that in 848 there was a dispute about the succession to the Pictish throne with Kenneth being one of the claimants. He solved the problem by getting all of his rivals drunk at a conference at Scone and killed them all. His claim to the Pictish throne was then the best and the Kingdom of the Picts and Scots was united. The laws were changed from a matrilinear to a patrilinear succession except where there was only an heiress. However, the law of Tanistry prevailed where kings were succeeded by their brothers and cousins in order of age. The kingships of the Gaels and the Picts probably underwent a gradual fusion which started with Kenneth and was more or less complete by the reign of Constantine II with the Pictish idea of kingship providing the basis for the merger with the Gaelic Alpin dynasty. The meeting of King Constantine and Bishop Cellach at Scone in 906 cemented the rights and duties of the Picts on an equal basis with the Gaels. Kenneth's reign began in 843, however, he probably didn't defeat his last rival until 848. 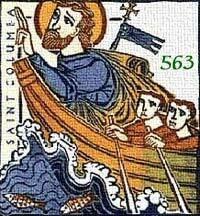 He has the relics of St. Columba moved from Iona to Dunkeld in 849. The Chonicle of the Kings of Alba states that he invaded Saxonia six times, captured Melrose and burned down Dunbar. It also states that the Vikings laid waste to Pictland, reaching far into the interior. The Vikings increased their settlement of outlying areas of Scotland at this time and the ties with Ireland were weakened and the ties with southern England and the continent were almost broken. Because of all these factors the union between the Picts and Gaels was strengthened and the kings were forced to consolidate their position. as far as the borders of Rome. Viking raids in northern Britain reached its peak during Constatine's reign. One of the Viking leaders, Amlaib, was killed by Constantine c.871 when he returned to Pictland to collect further tribute. The "Chronicle" and the "Annals of Ulster" report that the Vikings were again raiding in 875 and the Battle of Dollar was a massive defeat for the Picts with the Annals of Ulster stating that: "a great slaughter of the Picts resulted". Constantine was killed in battle against the Norsemen in 877, however, exactly where is not know. He was buried on Iona. Doniualdus son of Constantini held the kingdom for 11 years (889–900). The Northmen wasted Pictland at this time. In his reign a battle occurred between Danes and Scots at Innisibsolian where the Scots had victory. He was killed at Opidum Fother (modern Dunnottar) by the Gentiles. The attack on Dunnottar was probably part of a larger ravaging of Scotland by Harald Fairhair mentioned in the Heimskringla . The Prophecy of Berchán places Donald's death at Dunnottar, but attributes it to Gaels rather than Norsemen, other sources state that he died at Forres. Donald's death is dated to 900 by the Annals of Ulster and the Chronicon Scotorum , where he is called king of Alba, rather than king of the Picts. Constantine was buried on Iona. The ancient laws of the kingdom were revised and confirmed under his authority and the Gael or Dalriada obtained a confirmation of the old laws assigned them. He united the Kingdoms of Argyll and Pictland into the Kingdom of Alba or Albany. Máel Coluim mac Domnaill became king upon the abdication of his cousin Causantín mac Áeda (Constantine III) in 944 to become a monk. In 945 Edmund, the Saxon King of England ceded Cumberland and part of Westmorland to him on condition that he would defend that territory and be an ally of England. Edred, Edmund's brother obtained Malcolm's help in defeating Anlaf (Amlaíb Cuaran), King of Northumberland, devasted Cumbria and blinded two sons of Domnall mac Eógain, king of Strathclyde. The people of Moray who were part Scandinavian and part Celt were continually at war with the King. A rebellion occurred under Cellach, Maormor of Garmoran and Malcolm marched north, defeated and killed him. In 949–950, Máel Coluim raided Northumbria as far south as the Tees taking "a multitude of people and many herds of cattle" according to the Chronicle. The Annals of Ulster for 952 report a battle between "the men of Alba and the Britons (of Strathclyde) and the English" against the foreigners (the Northmen or the Norse-Gaels). This battle is not reported in the Anglo-Saxon Chronicle, and it is unclear whether it should be related to the expulsion of Amlaíb Cuaran from York or the return of Eric Bloodaxe. In 954 Malcolm was murdered at Ulurn or Auldearn or perhaps at Fodresach or Forres. He was succeeded by Indulph, son of Constantine II and in 961 Malcolm's son Duff became King. Cináed mac Maíl Coluim An Fionnghalach, "The Fratricide" succeeded King Cuilén mac Iduilb after the latter was killed by Amdarch of Strathclyde in 971. The Chronicle of the Kings of Alba was written in Kenneth's reign, but many of the place names mentioned are wrong, if not fictitious. The Chronicle states that "he immediately plundered (Strathclyde) in part. Kenneth's infantry were slain with very great slaughter in Moin Uacoruar." The Chronicle further states that Kenneth plundered Northumbria three times, first as far as Stainmore, then to Cluiam and lastly to the River Dee by Chester. These raids may belong to around 980, when the Anglo-Saxon Chronicle records attacks on Cheshire. In 973, the Chronicle of Melrose reports that Kenneth, with Máel Coluim I (Máel Coluim mac Domnaill), the King of Strathclyde, "Maccus, king of very many islands" (i.e. Magnus Haraldsson (Maccus mac Arailt), King of Mann and the Isles) and other kings, Welsh and Norse, came to Chester to acknowledge the overlordship of the English king Edgar the Peaceable. 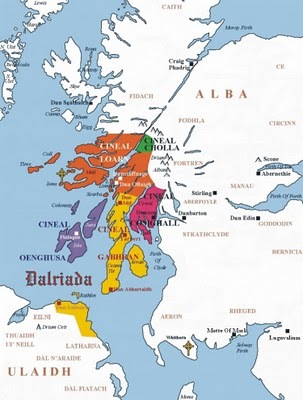 It may be that Edgar here regulated the frontier between the southern lands of the kingdom of Alba and the northern lands of his English kingdom. Cumbria was English, the western frontier lay on the Solway. In the east, the frontier lay somewhere in later Lothian, south of Edinburgh. The feud which had persisted since the death of King Indulf (Idulb mac Causantín) between his descendants and Kenneth's family persisted. In 977 the Annals of Ulster report that "Amlaíb mac Iduilb (Amlaíb, son of Indulf), King of Scotland, was killed by Cináed mac Domnaill." The Annals of Tigernach give the correct name of Amlaíb's killer, Cináed mac Maíl Coluim, or Kenneth II. Thus, even if only for a short time, Kenneth had been overthrown by the brother of the previous king. Adam of Bremen tells that Sweyn Forkbeard found exile in Scotland at this time, but whether this was with Kenneth, or one of the other kings in Scotland, is unknown. Also at this time, Njal's Saga, the Orkneyinga Saga and other sources recount wars between "the Scots" and the Northmen, but these are more probably wars between Sigurd Hlodvisson, Earl of Orkney, and the Mormaers, or Kings, of Moray. The Chronicle says that Kenneth founded a great monastery at Brechin. Kenneth was killed in 995, the Annals of Ulster say "by deceit" and the Annals of Tigernach say "by his subjects". Some later sources, such as the Chronicle of Melrose, John of Fordun and Andrew of Wyntoun provide more details which may or may not be accurate. The simplest account is that he was killed by his own men in Fettercairn, through the treachery of Finnguala (also called Fimberhele), daughter of Cuncar, Mormaer of Angus, in revenge for the killing of her only son. The Prophecy of Berchán adds little to our knowledge, except that it names Kenneth "the kinslayer", and states he died in Strathmore. Máel Coluim mac Cináeda Forranach, "the destroyer" succeeded to the throne in 1005 after killing Kenneth IV at Monzievaird in Strathearn. The Danes had attempted to settle Scotland in the past, but were unsuccessful. In 1005 they attacked again under King Sweyn with Olaus, Viceroy of Norway and Enet of Denmark landing at Speymouth on the coast of Moray. Malcolm then attacked them at Kinlos, but was forced to retreat. He was seriously wounded and the fortress at Nairn fell to the Danes. In 1006 Máel Coluim invaded Bernicia in the customary Crech Rig or "royal prey", a raid made by a new king to show his prowess in war. Máel Coluim laid seige to Durham, however, was defeated by the Northumbrians led by Uhtred of Bamburgh, Earl of Bernicia. In 1010 Malcolm attacked the Danes at Mortlach. Three of his commanders were killed early in the battle and Malcolm regrouped his troops and attacked and destroyed the Danish army. In gratitude he built the cathedral of Mortlach which was confirmed by Pope Benedict, but in 1139 the Bishopric was moved to Aberdeen. After this and other defeats King Sweyn sent his best general, Camus, who landed at Carnoustie, Angus and was attacked by Malcolm on the plains of Barrie. Camus was defeated and killed. The place is marked by the Cross of Camus at Camustown in Monikie where Camus supposedly is buried. He was killed by splitting his skull with a battle axe and in 1620 when the hill was excavated a skeleton was found with part of the skull missing. In 1014 another Danish force under Canute landed near Slaines castle, Buchan and was defeated. The bones of the dead soldiers are periodically exposed by the shifting sands. A treaty was signed and the Danes left Scotland the same year. Malcolm then attacked Uchtred, Earl of Northumberland in 1018 and was defeated, but Uchtred was murdered while on his way to visit King Canute. The Battle of Carham on the river Tweed was a victory for the Scots. To prevent another invasion Eadulph, his brother, ceded the region of Lothian to Malcolm in 1020. This was probably the land between Dunbar and the Tweed as other parts of Lothian were already controlled by the Scots. After his return from a pilgrimage to Rome in 1031 King Canute invaded Scotland to compel Malcolm to pay homage for Cumbria which he refused since he thought Canute an usurper to the English throne. However, Malcolm's grandson Duncan agreed after some negociations and Canute returned to England. Rodulfus Glaber, the Burgundian chronicler, recounted the expedition soon afterwards and described Máel Coluim as "powerful in resources and arms... very Christian in faith and deed." The root of the quarrel between Cnut and Máel Coluim lies in Cnut's pilgrimage to Rome, and the coronation of Holy Roman Emperor Conrad II, where Cnut and Rudolph III, King of Burgundy had the place of honour. If Máel Coluim were present, and the repeated mentions of his piety in the annals make it quite possible that he made a pilgrimage to Rome, as did Mac Bethad mac Findláich ("Macbeth") in later times, then the coronation would have allowed Máel Coluim to publicly snub Cnut's claims to overlordship. Cnut obtained less than previous English kings, a promise of peace and friendship rather than the promise of aid on land and sea that Edgar and others had obtained. Máel Coluim was accompanied by one or two other kings, certainly Mac Bethad, and perhaps Echmarcach mac Ragnaill, King of Mann and the Isles, and of Galloway. The Anglo-Saxon Chronicle remarks of the submission "but he [Máel Coluim] adhered to that for only a little while". Cnut was soon occupied in Norway against Olaf Haraldsson and appears to have had no further involvement with Scotland. Máel Coluim's daughter, Donalda, married Sigurd Hlodvisson, Earl of Orkney. Their son, Thorfinn Sigurdsson, was five when Sigurd was killed at the Battle of Clontarf 23 Apr. 1014. The Orkneyinga Saga states that Thorfinn was raised at Máel Coluim's court and was given the Mormaerdom of Caithness by his grandfather. The Heimskringla states that Thorfinn was the ally of the king of Scots and counted on Máel Coluim's support to fight the Norwegian king Olaf Haraldsson. By the 1030's Máel Coluim's son or sons were dead. Rodulfus Glaber in his chronicle states that Canute was godfather to one of Máel Coluim's sons. Malcolm died in 1034, the Annals of Tigernach reporting that "Máel Coluim mac Cináeda, king of Scotland, the honour of all the west of Europe, died." The Prophecy of Berchán, perhaps the inspiration for John of Fordun and Andrew of Wyntoun's accounts where Máel Coluim is killed fighting bandits, says that he died by violence, fighting "the parricides", suggested to be the sons of Máel Brigte of Moray. The account of his death by Marianus tells us that Donnchad I became king and ruled for five years and nine months and the Annals of Tigernach state that his death in 1040 was "at an immature age", he must have been a young man in 1034. The absence of any opposition tells us that Máel Coluim had dealt with any potential opposition in his own lifetime. The story of Malcolm's assassination appears to have been an invention of Hector Boece. 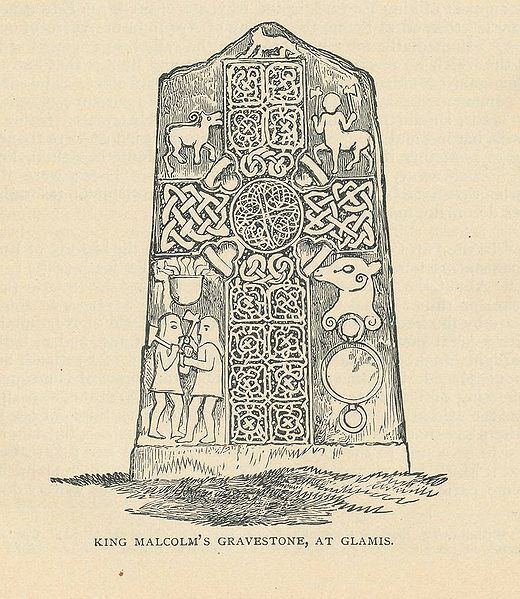 Tradition from Fordun's time or earlier, states that the Pictish stone known as "Glamis 2" was King Malcolm's grave stone. This stone was formed by re-using a bronze age standing stone and the iconography implies an association with Máel Coluim although some propose that the stone dates from as early as the 8th century. The Prophecy of Berchán: Irish and Scottish High-Kings of the Early Middle Ages - Benjamin T. Hudson, Greenwood, London, 1996.